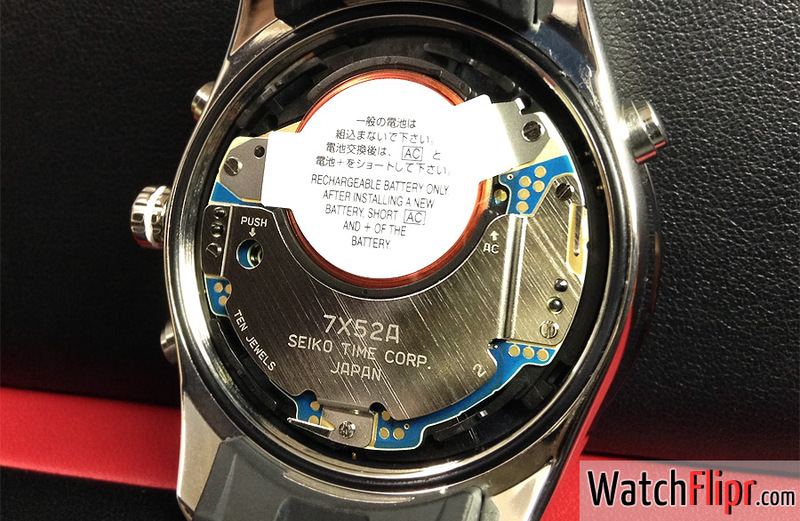 Watch Flipr hopes you Seiko fans enjoy this movement shot of the Seiko Astron GPS watch. This movement enables the watch to receive GPS signals from the Global Positioning System satellites. That signal sends the precise time and date to the watch based on the location of the wearer and information from the atomic clock which is accurate within 1 second every 100,000 or so years. Rechargeable battery only. After installing a new battery, short AC and + of the battery. For those of our readers who don’t want constant GPS radio waves bouncing off the wrist, don’t worry! Page 27 of the user manual clearly states that this watch is not designed to receive constant communication from the GPS satellites. In other words, it will only be transmitting when in adjustment mode. Based on this info, it also means that Seiko won’t be tracking you all over globe like your Apple iPhone… but hey, you never know. Seems like you have to be a MacGyver to change a battery in this thing. What is that little hole with an arrow that says push? So GPS receivers don’t transmit, they only receive. This isn’t a cell phone or other two-way radio device. While the watch can figure out what your location is and use it to look up the timezone and correct the time, it can’t store it or send it to anybody, even if it was set up for constant reception. Francia, Alemania, Italia, Es cualquier cosa Solo tiene para mudar cinco teclados y encima se me tilda mucho el celular y ocupa mucha memoria, esto no me sirve.